Thank you to all participants, volunteers and spectators who helped make the 2018 Bugatti 10k a huge success. The Bugatti 10k was held at the Prescott Hill Climb HQ on Wednesday, 8th August 2017. Please note that our results are in 10 year age bands to reflect the prizes which were awarded on the night. 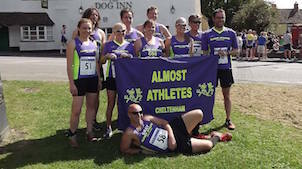 The results on the Glos AAA website are displayed differently, as their classifications are in 5 year bands. These results have already been published on Power of 10 and Run Britain.